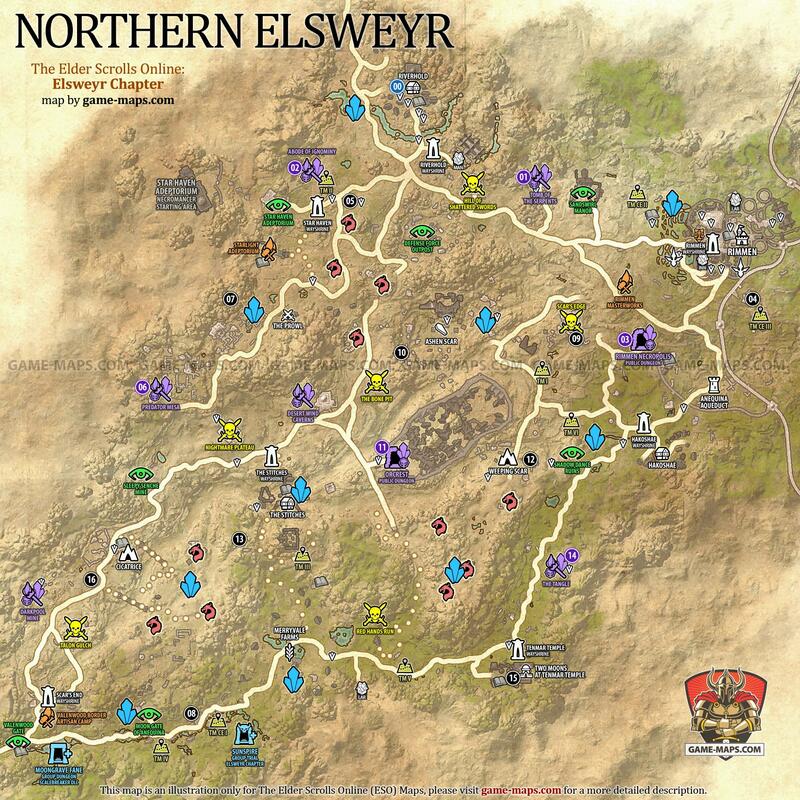 Elsweyr zone map for The Elder Scrolls Online: Elsweyr Chapter. Delves, World Bosses, Quest Hubs, Dungeosn and Skyshards in Murkmire. Main settlements in Elsweyr is Rimmen. This is homeland of the Khajiit race. The Elder Scrolls Online: Elsweyr Chapter will be available in June 2019. Elsweyr zone map. The Elder Scrolls Online: Elsweyr - ESO Maps, Guides & Walkthroughs. The Elder Scrolls Online: Elsweyr Chapter is coming June 2019 part of The Season of the Dragon adventure, which it consists of Wrathstone DLC, Elsweyr Chapter, DLC in Q3 2019 and DLC in Q4 2019. Elsweyr will bring new Necromancer Class with three unique Skill Lines: Reaper, Bone Tyrant, Living Death. Elsweyr is a homeland of Khajiiti race. Reaper - Imbue the dead with frost, fire, and lightning to bring ruin upon your enemies. Raise relentless hordes of the undead and allow your fallen enemies to intensify your unyielding assault. Bone Tyrant - Bend and break the dead to your will and use their remains to create impenetrable barriers and extend your own life. Control the battlefield with the bones of the departed. Living Death - Draw from the power of life and death to replenish and restore your allies. Resurrect your defeated comrades and keep them in the fight. Sunspire - 12 player trial.